Last week's episode delivered a couple of body blows with the deaths of Noah and Aiden. "Try" was less explosive, but almost as strong. While no one died, it was an hour steeped in tension. As that superb pre-titles sequence showed, people from both sides are quietly falling apart while pretending to get on with their lives. Something had to give and, predictably, it was Rick and Pete. The dilemma of how to mete out justice in a post-apocalyptic society is a juicy one (see the 1975 Survivors episode "Law And Order" for another brutal example). Rick wants to kill Pete because he's a danger to the community, while Deanna is willing to turn a blind eye to domestic abuse because the Safe Zone needs a surgeon. Both of them are convinced that they're in the right and neither of them are. It's certainly easy to sympathise with Rick's statement that exiling Pete would only lead to reprisals (especially with the alarming happenings beyond the wall), but his brutal attitude to law enforcement is only a few steps away from another Ricktatorship. There's also the little matter of his feelings for Jessie. This isn't justice – it's too steeped in his own desires for that. Likewise, simply ignoring the problem is not the answer and it reveals a weakness in Deanna's leadership. There are no easy answers at the end of the episode, though I hope the show finds an interesting way to deal with Pete, rather than simply having him killed by a zombie. But what to do about Rick? After his maniacal, blood-soaked breakdown at the end (nice one, Michonne), he surely faces exile himself. Perhaps a conveniently timed attack by the Wolves (or whoever they are) will prove that the new world does need Grimes after all. Though for what, I'm not quite sure – all the fight really proved is that he's terrible at controlling his anger issues. Elsewhere, that was a great scene between Glenn and cowardly Nicholas. For one of the original survivors (and a fan favourite from the comic), Glenn doesn't often get strong material like this. Admittedly, you can't help but think that it might backfire on him next week, but for now let's just enjoy him dropping a few truth bombs. Some respite from all of the nastiness came with Carl and Enid's moment in the tree. It looks like they're going to kiss, but don't, because of teen awkwardness. Surrounded by flesh-eating walkers, Carl is far more afraid of doing the wrong thing with the girl that he likes. A lovely, human moment. “Try” featured one of The Walking Dead's best ever pre-titles sequences – a montage of the characters set to Nine Inch Nails' “Somewhat Damaged”, courtesy of Aiden's “RUN MIX” CDR. I'm no NIN fan, but this was a superb juxtaposition, the angry industrial clatter reflecting the building rage in many of the characters. Next week is the feature-length season finale. That usually means at least one character being carried out feet first. We've lost quite a few regulars recently, but there's always room for more on this show. My money is on Sasha, Pete and Nicholas buying the farm, but creepy Gabriel surviving and being shamed by his actions. There's also the outside chance that Nicholas might shoot Glenn, but they wouldn't do that... would they? 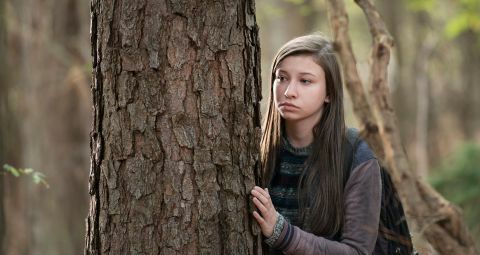 Pete and Rick come to blows, Sasha breaks down and Daryl and Aaron find something disturbing in the woods.